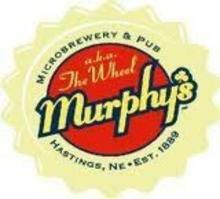 At Murphy's Wagon Wheel, the good times have been rollin' for over 125 years! They have been a tavern/pub/saloon since way back in 1889. Eighty-three years after the original building was erected, Jim and Shirley Murphy bought the Wagon Wheel, in 1972, creating Murphy's Wagon Wheel. It is currently owned by their son, Bob Murphy. In 1984 a third room was added, to bring Murphy's Wagon Wheel to its current size. During that time, a basic food menu of burgers and fried food was introduced, which today has expanded to a diverse array of favorites—everything from BBQ chicken and beef enchiladas to pork chops in mushroom sauce, sausage and peppers, crab bisque, chicken cordon bleu, twice baked potatoes, and great steaks at a great price. Murphy's meats are now cooked on a hickory wood-fired grill for the best taste, plus they offer a variety of veggies. Visit the website for specials every day of the week. Murphy's is an atmosphere of fun that's family friendly and maintains the historic look that's been a part of the place for well over a century. Murphy's also cater every kind of event, from weddings to meetings to corporate anniversaries, and carry wearables that include tee shirts, ladies tops, and ball caps.